Powerful, yet easy-to-use business software. Trusted system used by many companies with a strong support channel to provide after sales service. 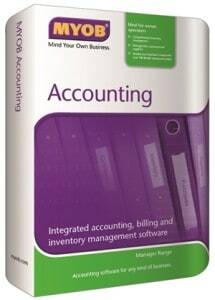 Effortless and efficient management of your accounting records. Click here for more accounting software features. Integrated inventory management solution. Click here for more inventory software features. Customer Relationship Management (CRM) system to help increase business intelligence capabilities. If you are transacting your business in one currency and you only require one user to access your software, MYOB Accounting is the optimum software to meet all your business needs. If you require a software with multi-user capability, multi-currency reporting and time billing function to track your hourly activities, please refer to our most feature-packed software, MYOB Premier and MYOB Premier Plus. Our extensive network of professionals are here to provide you with a complete end-to-end solution from pre-purchase advice to after-purchase support. Internet A broadband internet connection will be required for processing registration of software as well as activation and confirmation of client data files. This will also be a requirement for receiving automatic software updates and accessing online help.